Powering wearable devices with your own sweat? A team of engineers from the University of California San Diego makes it possible. 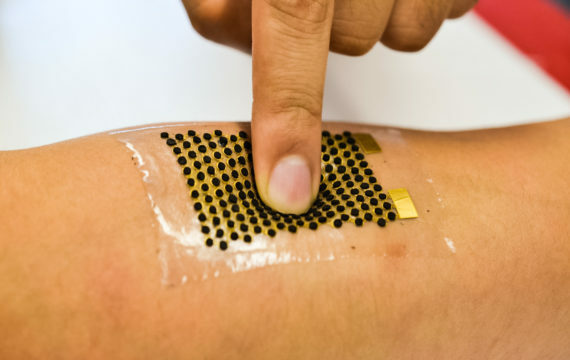 It has developed stretchable fuel cells that extract energy from sweat. The biofuel cells are capable of powering electronics, such as LEDs and Bluetooth radios, generating 10 times more power per surface area than any existing wearable biofuel cells. The devices could be used to power a range of wearable devices. Not only smart watches, but also medical monitoring devices. The team of engineers believes the epidermal biofuel cells are a major breakthrough in the field, which has been struggling with making the devices that are stretchable enough and powerful enough. The group used a combination of clever chemistry, advanced materials and electronic interfaces to build a stretchable electronic foundation by using lithography and by using screen-printing to make 3D carbon nanotube-based cathode and anode arrays. The biofuel cells are equipped with an enzyme that oxidizes the lactic acid present in human sweat to generate current. This turns the sweat into a source of power. The results were published in Energy & Environmental Science. The paper describe show the engineers connected the biofuel cells to a custom-made circuit board and demonstrated the device was able to power an LED while a person wearing it exercised on a stationary bike. To be compatible with wearable devices, the biofuel cell needs to be flexible and stretchable. So engineers decided to use what they call a ‘bridge and island’ structure. Essentially, the cell is made up of rows of dots that are each connected by spring-shaped structures. Half of the dots make up the cell’s anode; the other half are the cathode. The spring-like structures can stretch and bend, making the cell flexible without deforming the anode and cathode. The biggest challenge was increasing the biofuel cell’s energy density, meaning the amount of energy it can generate per surface area. Increasing energy density is key to increasing performance for the biofuel cells. The more energy the cells can generate, the more powerful they can be. “We needed to figure out the best combination of materials to use and in what ratio to use them,” said Amay Bandodkar, one of the paper’s first authors (then a Ph.D. student in Wang’s research group, now a postdoctoral researcher at Northwestern University). To increase power density, engineers screen printed a 3D carbon nanotube structure on top the anodes and cathodes. The structure allows engineers to load each anodic dot with more of the enzyme that reacts to lactic acid and silver oxide at the cathode dots. In addition, the tubes allow easier electron transfer, which improves biofuel cell performance. The biofuel cell was connected to a custom-made circuit board manufactured in Mercier’s research group. The board is a DC/DC converter that evens out the power generated by the fuel cells, which fluctuates with the amount of sweat produced by a user, and turns it into constant power with a constant voltage. Four test subjects were then equipped with the biofuel cell-board combination, exercising on a stationary bike. The subjects were able to power a blue LED for about four minutes. There is still a lot of work to do, the engineers state. First, the silver oxide used at the cathode is light sensitive and degrades over time. In the long run, researchers will need to find a more stable material. Also, the concentration of lactic acid in a person’s sweat gets diluted over time. That is why subjects were able to light up an LED for only four minutes while biking. The team is exploring a way to store the energy produced while the concentration of lactate is high enough and then release it gradually.